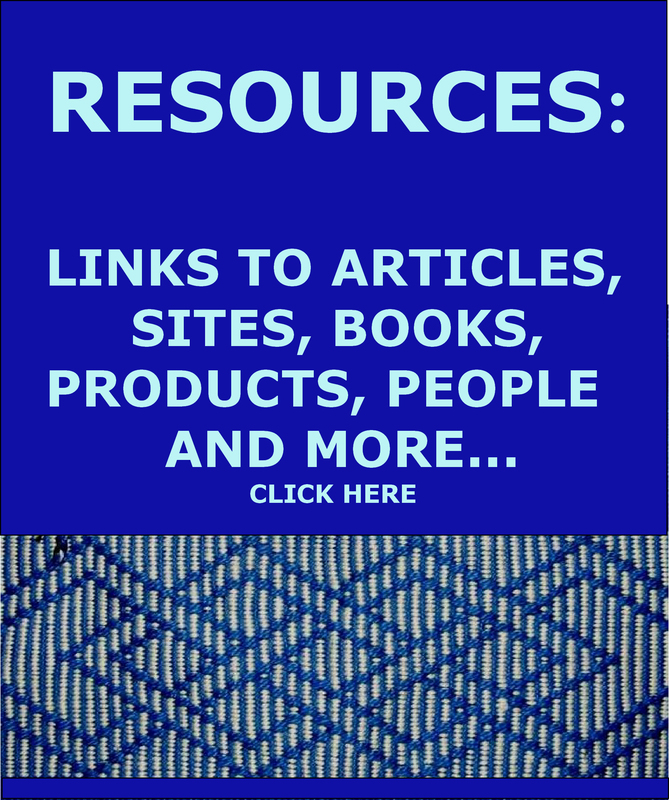 Backstrap Weaving | My weaving , my indigenous teachers, my inspiration, tutorials and more…….. Happy New Year to all of you! I usually let December 31st slip on by but this time it was a little different because it marked the finish of my latest e-book on the eye-pattern tubular band and other decorative finishing techniques. It really did feel like a big finish and, as the fireworks boomed outside (we tend to only have the noisy ones here and not so many of the pretties), I almost felt as if they were cheering for me. I guess the end-of-year means something different for each and every one of us. This is what it meant to me at that very moment, and on and off until 2am! There are no official public displays of fireworks. People buy them in the market and let them off in their back yards. It can go on all night! So….about the e-book. You may know this pretty eye-pattern tubular band by its Quechua name, ñawi awapa. 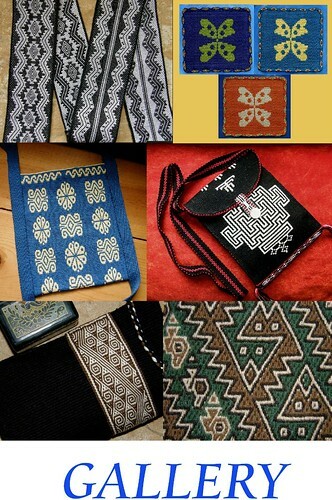 I have seen it woven in various places across the highlands of Peru and Bolivia. Because I know of at least one other local name that is used for it, I decided to simply call it the eye-pattern band in my book. Weaving the eye-pattern tubular band in the central Bolivian highlands. I have been happily applying it to my small woven pieces ever since I learned it. The novelty of seeing those little eyes appearing along the band never wears off! Used as an edging, it is the perfect finish to my woven pieces. In the highlands it is used for both decorative and practical reasons as it protects the edges of the fabric which are often the first parts to wear out. Here’s my latest finished project using a simple two-color eye-pattern band as the edging on my Andean Pebble Weave wrist-cuff . The tubular band is woven and sewn simultaneously to the perimeter of the cuff using the weft as the sewing thread. When I was learning to weave a coca-leaf bag with my teachers in Bolivia in 1997, I realized that removing the cloth from the loom did not mean the end of the project. It actually signaled the beginning of a whole new process that involved embellishing the piece with various decorative finishes. I saw that the eye pattern has different levels of complexity in different regions and that the methods used to create it can also vary. These kinds of similarities and differences have always fascinated me. And, I have since learned that the eye-pattern tubular band is fun to weave on its own rather than purely as an edging. It makes lovely necklaces on which to hang pendants, sweet bracelets and bangles, and can be used in a variety of ways in accessories….fobs for keys and tools, lanyards, eye-glass holders, shoe laces, straps and drawstrings…. From my own experiments, I show you how to create straight, curved and spiraled versions of the tubular bands. They all have their particular charm! One of the many fun things about this pattern is that you can make it as subdued or as lively as you like. I am generally limited to using only two colors at once in a pattern when I do most of my basic pick-up weaving techniques. The eye-pattern band allows you to use up to five or even more colors in the pattern. My favorite combination is usually with only three but you can make them as colorful as you like! The traditional way to weave these tubular bands is by having the narrow warp attached to the weaver’s waist or belt with a piece of string. String heddles are not used at all and so the weaver’s body is simply suspending the warp. The weaver is not required to move the body back and forth to add or relax tension on the warp to help operate the heddles. You should at least be familiar with weaving terminology…warp, weft, beat, shed etc…before you approach this. Because heddles are not used at all to create the sheds, the warp can be easily set up and woven using an inkle loom or any other loom or frame that allows you to adjust tension for take-up. Full instructions on how to set up and weave the independent band on an inkle loom are included in both versions of the e-book. Here I am weaving one on my tiny Ashford Inklette. My e-book is available in two versions. One contains the instructions for weaving the eye-pattern band as an independent tube and then goes on to show how to weave and sew it simultaneously as an edging along the two sides of a project, or around corners, covering all edges. I used a two-color eye-pattern tubular band to dress up a simple pouch that I made with commercial cotton fabric. The cross-knit-loop stitch decorates the mouth of the pouch. Other decorative sewn finishing techniques such as the coil stitch, pictured below, are included with dozens of step-by-step photos as well as drawings. The other version of the e-book is for those who only want to weave the band as an independent tube, perhaps for using it in jewelry and accessories, and aren’t interested in the sewing techniques. Both books provide ideas, instructions and suggestions for finishing the bands and for using them in such projects. There are links to both versions in each one’s product description on the Patternfish page. Both e-books include access to supplemental video clips. These are not stand-alone tutorials. They were designed to allow you to see “in action’’ some of the processes. The techniques are thoroughly explained in the books using over 140 photos, drawings and diagrams and so the videos really are optional supplemental material. With these additional materials I hope to be able to cater to a greater variety of learning styles. I had a lot of fun making those video clips and I am thrilled with them! They can be viewed at Patternfish after check-out and downloaded, if you like, although they really are better viewed after you have read each tutorial. Little video camera symbols in the book will let you know when there is a related video clip to be viewed. 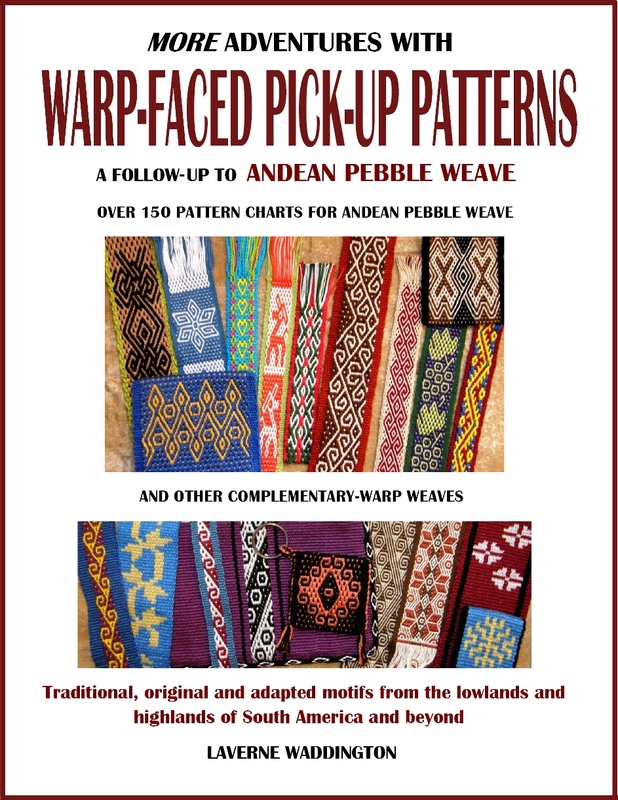 For my left-handed weaving friends, I have included instructions in the Appendix on how to adapt the weaving technique to suit. You will notice that I said for my left-handed weaving friends. I am sorry, but for the sewing techniques in the book, I have left it up to you to adapt. My left-handed students have always been so awesomely good at doing that in my classes! I will leave you with this picture of me with one of my teachers, Maxima, spending a tranquil afternoon together. I weave as Maxima sews a decorative edging to a small pouch. The pouch on which she taught me to weave and sew a tubular band, lies on the ground between us. This was on my birthday back in 2011….a lovely way to spend it. So, I hope that you will enjoy the e-book and I look forward to seeing what you create using it! (Hair update, for those who are interested…. I now have a blunt-edged chin-length hair cut with a good five months of grey growth!). Anyone who is familiar with my work will know that I like weaving leaves….creeping leaf-laden vines, fallen leaves lying among berries or on the snow, shadowy leaves floating on a background of translucent cloth. I have used them in a variety of structures: using supplemental weft on a warp-faced plain-weave ground, in intermesh, in double weave, in Andean Pebble Weave, and, more recently, with supplemental weft on an open mesh-like ground. I like to consider them my signature patterns. Leaves on the snow and leaves among the berries in silk. Leaf patterns in two very different cotton projects that both use supplemental weft threads to create the motifs. A band with a leafy pattern is the one I chose to be my ”reward” weaving whenever I decided to take a break from writing my latest book. Right after I wrote my blog post ”Taking My Own Advice” in which I talked about the importance to me of having these little rewards, I set about choosing thread and planning a small project. I wanted a wrist cuff but one that was a fair bit wider than others I have woven. I also wanted one in black and white to go with a necklace that I often wear. I have a lot of DMC #12 perle cotton and decided to go with that. It is silky smooth and strong in contrast with the sticky wool and delicate hand-spun cotton singles that I have been weaving with lately. Oh my, how those sheds just pop open with the lightest touch! I chose my pattern, one that I included in my latest book of 100 patterns…Complementary-warp Pattern Book…….leaves, of course, this time in pebble weave. I had first created this pattern for a piece that became the cover for a journal in which I combined colors using small skeins of naturally-dyed silk that I had been given. This pattern of leaves is included in the Garden set of patterns in the latest book. The garden set includes various flower motifs, a butterfly, a humming bird and of course the leaves with a flower bud. And, there is whole other set that is made up of just bees. I made my heddles on my wrist-cuff warp and then, there the warp sat for two weeks, tied to the bottom of my bed and stretched out across the floor. I can’t say that it sat there untouched because I stepped on it, tripped over it, and even got things tangled in it as I sat on the floor next to it, tapping away at my computer keys, writing my book and studying my samples. My bedroom floor is my weaving studio and my desk! I am afraid that I was a little impatient with that warp and would just shove it aside. The thing that had become entangled in it would be favored over the fine threads in the warp. I was almost convinced that I had abused it so much that it would be beyond recovery for weaving. I was so absorbed in writing the book and taking photos that I guess I just didn’t need time out for ”reward” weaving. The book itself required a certain amount of weaving and I guess those projects alone gave me enough loom time to keep me very happy. I would often be typing with the sample I was currently weaving still attached to my waist! Now I am in a period between two major parts of the book-writing project and I decided to take a break and enjoy my little leaf pattern. A little leafy retreat. As you can see, the abused warp survived and I was able to weave enough band to make a cuff. The fineness of the thread allowed me to weave two columns of the pattern and I enjoy the mental gymnastics of flipping the pattern in my head as I pick my way across the threads. As for the book on which I am currently working, you might be wondering what it s about…well, I like surprises…and I’ll let you know soon! This is what Kristin has on her loom. She is making cloth for a bag project using her own hand-spun alpaca yarn and using the pattern from a piece I wove many years ago and photographed for my very first book. Seeing her project made me fondly remember that old wool weaving of mine. I turned it into a pencil case for a friend. It was tragic when one of his pens leaked ink onto it! Kristin is an awesome spinner of all kinds of fiber and she is handling what must be a sticky and tricky piece on her backstrap loom with two sets of string heddles holding her precious hand-spun thread. Her photo has me admiring her yarn as much as the weaving. Maria Leticia Galve in Argentina sent me a picture of the band she wove using one of the six cat patterns that are charted in my latest pattern book. It is heart- warming seeing these patterns being enjoyed by people around the world. I love the colors and the way she has flipped the cats back and forth. The cats are just one part of the Animal set of patterns in my book. 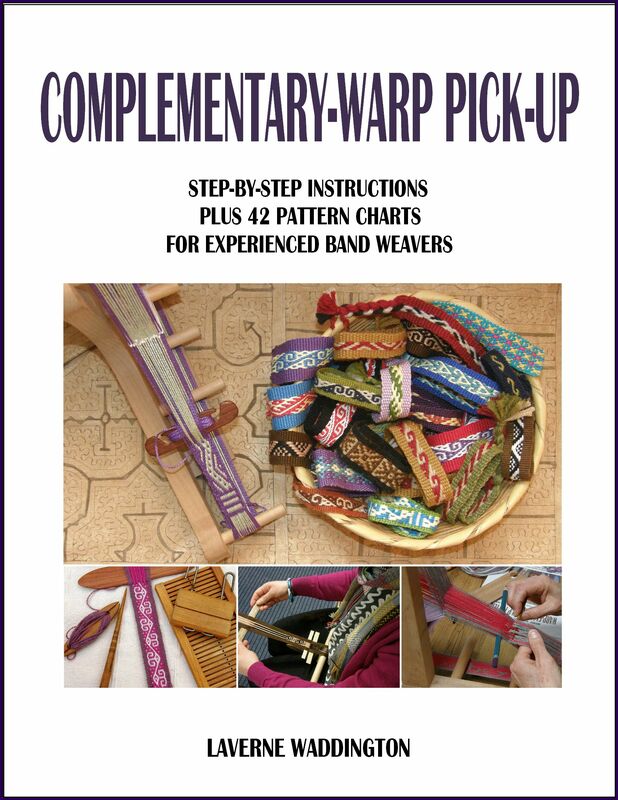 Katrina Michaels is using one of the smaller patterns from my instructional book, Complementary-warp Pick-up, to create a guitar strap. That’s a lovely set of tools that she has there on her inkle loom. Her swords are placed within the picking cross ready to help her select threads for the next row of pattern. This is a technique favored by many who don’t want to fiddle with extra sets of heddles or whose looms don’t have enough space for them. This picking cross method is the one I teach in the Complementary-warp Pick-up book. Kristen, on the other hand, is using the two-heddle method, as am I, for the leaf pattern on my cuff. Each weaver decides on the method they prefer, or choose the one which best suits the pattern they are weaving and/or the equipment they are using. The fabric for my new cuff is off the loom. I see that I have enough length for the two ends to overlap. I can use simple snaps to close it. But now I want to edge it with a patterned tubular band. This is weaving and sewing combined, and I find it so relaxing. You can see that I have just started the tubular edging on the upper right. I get a kick out of turning corners when I do this sewing! I wont have a button under which to hide the start and finish ends of the tubular band. I can, however, hide the join beneath the part where the two ends of the cuff overlap. But, let’s see how neatly I can manage to connect the two ends together. I have been trying this with increasing levels of success with heavy-ish wool. I don’t know what my chances are of achieving neatness with this DMC #12, though! I’ll keep you posted. As I said earlier, if you are a follower of my blog, you will know my love of leaf patterns. You will also quite likely know that I don’t really do Christmas. However, I had fun last year at my brother’s place designing a bunch of Christmas-themed patterns in pebble weave. The feedback from my sister-in-law as I wove and re-wove them, making little adjustments along the way, was very helpful. I loved the way they turned out. Then I put them aside to await their publication in my pattern book in March this year. It has been a long wait since then to pull them out for Christmas this year. I think they do look very jolly and, with these, I will wish you all a joyous and peaceful time whatever you choose to do this holiday season. Spinning cotton had certainly not been part of The Plan for how I was going to spend my time during this Bolivian summer. I spend a fair bit of time when I am away sitting in airports, or on planes, trains and buses, and that is when I like to get out my notebook and create sketches and notes on the projects I would like to attack when I get home. Cotton spinning was not one of them. However, the seed had kind of been planted, although it had not quite taken hold, when I was in Australia. Elizabeth, who came to weave with me, gave me a lovely gift of prepared cotton, a tahkli and a pretty dish in which to place the spindle tip. She had taken classes with Joan Ruane earlier that year and gave me a little demonstration one lunch break. We were so absorbed and I was so swept up in her enthusiasm that we forget to eat! I had learned to spin cotton in 2007 in coastal Ecuador when I stayed with a family of spinners and weavers along with anthropologist Kathleen Klumpp, but had not taken it much further. I practiced a little when I got home but never spun any useful kind of amount. I certainly couldn’t imagine using the clunky kind of thread I was producing in my weaving and I didn’t have the will to practice more in order to refine and perfect the skill. I had brought back some of Trini’s prepared cotton and still have it sitting in the closet. Now there is a good chance that I will spin it. This cotton had passed through the hands of the many grandchildren in the family who would sit on the floor after dinner and pluck out the seeds. Mariana, Trini and I had taken turns in pounding it. I had even made myself a miniature stand from a tree on their property on which to drape the cotton while spinning it. I simply couldn’t see any reason to spin my own cotton. I didn’t feel that the cotton I was buying was lacking in any qualities that I needed for my weaving….until now. I want cotton singles that can come somewhere close to the fine thread that the weavers in Guatemala use for their sheer cloth. They are able to buy skeins of the commercially-spun cotton singles that they use.. Some weavers in Mexico, who also create this kind of sheer cloth, go to the trouble of splitting the ply of commercially produced cotton if they want to weave the finest pieces. Can you imagine? The seed of interest that Elizabeth had planted in me in Australia started to sprout when Deb in North Carolina showed me the amazing piece of sheer white cloth that she had bought in Guatemala. I actually own a small sample of this cloth. I have taken it out of the closet many times to admire. There is a wonderful article by Cherri M Pancake and Suzanne Baizerman in the 1980-81 issue of the Textile Museum Journal on the production of Guatemalan gauze textiles. The article states that Handspun single-ply (Z-spun) cotton of varying fineness and degree of twist was used to produce some of the historical textiles. This is referring to textiles that were produced prior to the last decades of the nineteenth century. It seems that the weavers now only use commercially-spun thread. Kathleen Vitale of Endangered Threads has produced a video on these sheer textiles that are being produced in both Guatemala and Mexico. If your mind boggles at the idea of splitting the ply of your already fine two-ply cotton, take a look at the technique used by the ladies in Mexico in this video! I brought back a big ball of hand spun doubled cotton singles from Guatemala. I don’t know for what style of weaving that thread had been intended. I separated the strands and used the singles in my experiments in weaving the sheer cloth. My cloth is heavy next to the Guatemalan work! So far my own attempts at spinning cotton is producing thread that is only ever so slightly finer than the Guatemalan thread I bought but, even so, I know that I will enjoy weaving with it. In the meantime, I decided to try weaving a small sample without a reed. I only wish I had used my own hand spun for this experiment. If I had done so, I could have killed two birds with one stone…testing the strength and suitability of my own thread as well as experiencing the difficulties of maintaining consistent sett without a reed. The sample was very small….just over four-and-a-half inches wide. After all my talk of temples in my last blog post, I didn’t end up using one. I did find it very useful to use the comb, pictured above, to beat rather than my usual sword/beater. I used a coil rod at the start to help establish the sett. I took measurements from the scarf I had woven. If you are familiar with the ”twisty sticks” that I like to use in my backstrap loom set-up, you will understand what I mean when I tell you that I also used a coil rod in place of the far stick in the twisty stick pair. I think that was helpful. There was much time spent keeping a close eye on warp threads that might be threatening to wander out of position, probably way more time than was necessary. I was happy with the way the width remained consistent but won’t get too carried away with happiness. This was, after all, a really small sample. And then, I wove a sample with the same number of ends using the reed. It takes time to thread the reed but then you can just relax and weave. These experiments are preparing me for the time when I can either get hold of much finer singles, or spin my own. Do I then abandon my 24dpi reed which won’t be fine enough, or thread multiple ends in each dent? I have been asking some online weaving friends about the very common practice of threading reeds with multiple threads per dent to achieve a finer sett on their floor looms and have been hearing about their experiences with the ”reed marks” which can sometimes result. Apparently, they quite often disappear in the wash and one needs to sample to see if they will do so according to the material and structure that is being used. I think that reed marks would annoy the heck out of me! However, it’s good to know that these marks sometimes do remain in the cloth even after washing and that their occurrence is pretty much normal. I need to get over that if I am to going to be able to enjoy the ease of weaving this kind of cloth in fine thread with a reed. What about you…do you have any thoughts on how having multiple threads in the reed dents will affect the kind of open cloth I am weaving? So, I have been spinning. I have a surprising amount of prepared cotton to spin in a big box in my closet. Back in 2009 and 2010, I was swapping llama bone tools and Bolivian drop spindles by mail with folks in Australia, the USA and Europe for various bits and pieces. Quite often I was sent cotton as a swap from generous people…way, way more than I had initially bargained for! I have natural green and brown cotton ready to spin and all sorts of other natural tones as well as dyed stuff. The picture above shows just a small sampling. And then, there’s the Indian charka that my friend Lisa gave me in 2010 and all kinds of useful tips in the book that Stephanie Gaustad gave me when she came to weave with me on one of my U.S visits a couple of years ago. I can’t spend my time only spinning. I need to be weaving too. So, I prepared a warp for anther bag with built-in pocket. Both this new bag and its pocket are bigger than the green example I recently wove and decorated. And, this latest example is far less colorful…black and white and that’s it. I am working my way up to a shoulder bag that will will have a large built-in pocket and pick-up patterns. I am done with sampling for this larger project now. I think I have remembered and put into practice all I need to review for the creation of the pocket and am ready to move on to the real project. Here’s the warp set up with its longer pocket section. I actually remembered to take a photo of this part of the process. I edged the pocket with a patterned tubular band this time instead of cross-knit looping. And then, I edged the entire bag, including the mouth, with the same kind of patterned tubular band. The pocket is just the right size for my Bolivian ID card. I added a snap to close the pouch, rather than a zipper, as well as a decorative button. It looks a little dull in the picture above and so I stuffed the pouch and the wee pocket with bits and pieces to give it some life. Now, I would like to show you what a couple of my weaving friends have been doing with the bamboo reeds that they made with Bryan Whitehead at the ANWG conference in 2017. I will show just one project from each of Tracy and Kristin for now (so hard to choose) so as not to overload you with all that beauty! I’ll show more in future posts as the reed topic continues…. Here’s Tracy’s work using the 22dpi reed that she made herself with natural 10/2 cotton from Lunatic Fringe. It looks so awesome on the loom with that lovely roll of finished cloth on the front beams! And here’s the finished cloth…so gorgeous! You can read Tracy’s blog post about the making of her reed at the ANWG pre-conference workshop with instructor Bryan Whitehead here. One of the reeds that Kristin made in the same workshop is 25dpi. She used it on her backstrap loom with natural and blue 16/2 hemp from Hemp Traders that she combined to weave fabric for several towels…. These ladies also do some awesome work on their backstrap looms with their hand spun yarn and reeds. I’ll be showing you more from time to time. This if from Penelope in the UK. She says that the hat is nalbinded in Oslo stitch using some unknown chunky grey wool…..Felted down to size. I created the chart for the pick-up pattern for her. It is based on a motif that is often seen in tablet-woven bands. Penelope says that the pattern is based on a 10thC viking find from Dublin that many call ‘Little Dragons’. The same pebbly patterns can be created without the use of the additional heddles as Marsha is doing here…. Marsha is using the technique that I teach in my third book, Complementary-warp Pick-up. If you don’t think you would like to deal with the additional heddles that Marie Paule is using, or if you don’t think that your particular loom will comfortably accommodate them, my third book teaches a method that does not use them. It is a slower method, but it suits a very wide range of looms and can be used for other complementary-warp structures besides Andean Pebble Weave..
And here’s some of Bradie’s work. I wove with her in Vermont a few months ago. She was using an inkle loom but is already wondering about going on to weave wider pieces. I feel a backstrap loom coming on! 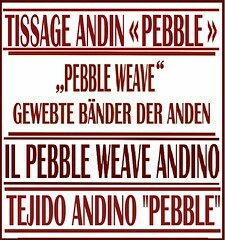 This and other Andean Pebble Weave patterns can be woven with two sets of heddles, as Marie Paule does, or without them, as Marsha does. So, it’s back to my spinning and maybe I will get the silk on the loom this week. I have already put together my pre-warping project notes and all is set to go unless I decide to go with the wool pocket shoulder bag instead. And there’s always a chance that something else will come along to have me throwing The Plan out the window…..
One weaving tool which hasn’t really made its way into my kit is the temple, an instrument that helps weavers maintain consistent width in the cloth they are producing. I have never really felt the need to use a temple and that’s most likely because I haven’t used my backstrap loom to create the kind of cloth that I felt required one. The ladies with whom I studied in Guatemala used temples. They were wonderfully simple tools….a piece of bamboo that sat underneath the cloth with a couple of small nails holding it in place. I have to admit that I would cringe every time we pushed those nails into the edges of the woven cloth. When I took the pieces that I had started weaving with my teachers in Guatemala back to Bolivia to finish, I continued using the temples for a while. However, I soon abandoned them as I really felt that they weren’t doing anything for me. I have seen some fine Bhutanese textiles with horrible holes gouged at intervals into the edges from the sharp ends of the temples and that, more than anything, has really put me off using them. But, now as I am typing, I am remembering that there has actually been one piece of cloth that I wove where I could see a clear need for a temple. It was a wide silk piece that I wove some time ago. I did manage to get away without using a temple because I couldn’t bear the thought of pushing nails or even pins into the edges of the silk. When weaving this wide piece, I was finding that the cloth would ripple slightly as I propped the shed open ready to pass the shuttle. I had to try and grab the edges of the cloth, first one side and then the other, to straighten and smooth the cloth so that I could be sure that I was laying in the right amount of weft. A third hand would have been handy! It was clumsy and slowed me down but I was willing to do it to avoid using the ”dreaded” temple. And, my weaving teachers in coastal Ecuador who wove on vertical looms rather than backstrap looms, used a similar style of temple cut from a large tube of bamboo that they attach to the upper face of the cotton cloth on the loom. I remember really struggling to bend that slat of bamboo into place each time it had to be re-positioned on the cloth. This heavy-ish sturdy cotton did not suffer at all from the pointed tips of the temple. Why all this talk of temples? Well, I would like to weave another sheer cotton piece like the one I just wove but using much finer cotton. I don’t have a reed that is fine or wide enough for the piece I have in mind and so I will have to resort to trying to maintain the sett and width by other means just like the Guatemalan weavers in Alta Verapaz do. The temple will help with the width. Maintaining the sett will be another story! What tool do the ladies in Guatemala use?….skill and lifetimes of experience and know-how passed down through generations! Until I get the fine cotton singles that I would like to use, I will practice with the little bit of hand spun cotton that I have left over from my most recent project. For that project I used a reed and so I have a sample from which to take calculations for width and something to guide me to determine and try to maintain the spacing between warp threads. I have wound a short warp with half the number of ends that I used for my scarf. Wish me luck! The piece at the bottom of the picture is the temple that came with a Karen loom that a friend gave me. Pins have been taped to a piece of wood and the temple was sitting on the back side of the warp-faced cloth. The bamboo pieces are the temples I was using with my teachers in Guatemala. The nails that pierced the cloth and then turned into the open ends of the bamboo, are sitting on top of the tongue depressor. I was wondering if cutting points into a piece of heavy cardboard like the black stuff you see there and reinforcing it with a tongue depressor would also work. It was working well for Franco. I would love it if I could get something like this to work for me. It measures and maintains width all at once! As for my current project…it is finished! Except for the very first part which I un-wove and turned into fringe, I got a consistent 9 1/8 inches of width. After finishing the hem-stitching the far end, I slowly unrolled the cloth and worked my way back to the start, burying weft ends as I went. Then I cut the weft out of the first wider part of the cloth and hemstitched that end. Here it is off the loom waiting to have its fringe twisted before being washed and pressed. Procrastinating! Enjoying the cloth and taking pictures because I was nervous about what was going to happen to it when it was washed! Moe procrastination…yes, it’s sheer now but will it lose this translucency when it has been washed? A whole day has gone by. Tomorrow I’ll wash this thing. Post-wash and press: it lost between 1/8” and 1/4” in width and the warp threads moved closer together ever so slightly. It feels so soft! Post-wash cloth with twisted fringe. Post-wash verdict: I love this super soft supple cloth that is so unlike anything I have woven before! Now I am thinking about dyeing it. Should I? During all the pre-wash dithering, I decided to take a sample that I had woven before my last trip away and make it into something. You might remember that I wanted to make a wool shoulder bag with a built-in pocket in the style of the ch’uspas (coca-leaf bags) that the Bolivian weavers make. I learned how to set up the warp and weave the pocket back in 1997 with my teachers in Potosí. This small green piece is the wool sample that I most recently wove to refresh my memory of the technique. I edged the little pocket with triple cross-knit looping. I decided to go ahead and make this into a little zippered pouch. I edged it with a tubular band style that is woven in Chahuaytire, Peru which also served as the strap. The bottom is decorated with coil stitches and the pocket is edged with single cross-knit looping. A four-strand braid makes a nice zipper tab. The wool surface loved to attract the stray bits of cotton that I have had flying around during my latest project. I had started gathering materials for this project before I had finished weaving the cotton scarf. I thought about what I could possibly fit into the tiny pocket and found that my door key sat within it perfectly. Two days later when I wanted to go out, I turned my apartment upside down looking for my door key. I was locked in and had completely forgotten about having placed the key in the little pocket. I had to call a friend who keeps a spare for me to come and let me out. Another two days went by before I picked up the little green bag once more to work on it and discovered the secret contents of the little pocket. Duh! So….I guess the hand spun-cotton-with-temple experiment is next. I have also wound my skeined silk into balls ready for warping. I am thinking about weaving a silk cowl….just a simple tube to drape around my neck instead of a whole scarf. At three-and-a-half months into the grey hair transition I am still thinking about wearing color around my face to brighten things up a bit. Until next time……..